Rugged and red, with towering waterfalls, Aboriginal rock art, huge tidal variations, saltwater and freshwater crocodiles, thousands of islands and less people per square kilometer than almost anywhere else on earth, the ancient 163,521-square-mile Kimberley region on the north side of Western Australia offers a wilderness cruising experience like no other. Broome, on the west coast of the Dampier Peninsula, is a gateway to the region; from here, either fly north into the heart of the Kimberley and cruise back, or cruise north and fly back. For a weeklong Southern Kimberley experience, begin by flying nearly 300 miles northeast from Broome to the fan palm-forested Mitchell Plateau. From here, a helicopter will whisk you over the tiered Mitchell Falls (a place of cultural and spiritual significance for the Wunambal people) and down to the Hunter River wilderness and your yacht. Cruising up the Hunter River to Careening Bay, you’ll enter the mouth of the Prince Regent River. Beneath the stark gaze of Mount Trafalgar and Mount Waterloo, venture past sandstone cliffs and gorges toward the beautiful terraced rock formations of Kings Cascades, where you can (cautiously) observe large saltwater crocs. The following day sample some of the world's best oysters, straight from the rocks in Camden Harbor, where the Kimberley’s first European settlement was attempted (and soon abandoned) in the 1860s. Then cruise through Kuri Bay, the region’s first pearling settlement, to Langii, where the sandstone “Petrified Warriors” represent warriors killed in an Aboriginal Dreamtime battle. Linger here awhile fishing for barramundi and threadfin salmon in Doubtful Bay; exploring 154-square-mile marine life-rich Montgomery Reef, an inshore reef that appears to rise from the ocean on a falling tide; trekking to Raft Point’s Aboriginal rock art cave galleries; and photographing the Horizontal Waterfalls, a pair of breaks in the McLarty Range. When to go: Travel between April and September, the Kimberley’s dry season. Pearl of a tour While wandering Broome’s Chinatown, delve into the town’s maritime and pearling heritage at Pearl Luggers, where guided tours explore the hazards of early pearl diving and offer a taste of pearl shell meat. Try before you buy (a six-pack) Broome’s fiery Cable Beach sunsets demand a spicy beer. At award- winning Matso’s Broome Brewery, housed in a circa-1910 former bank, you can sample chili beer and other intriguing brews, such as lychee and ginger/mango. Rugged and red, with towering waterfalls, Aboriginal rock art, huge tidal variations, saltwater and freshwater crocodiles, thousands of islands and less people per square kilometer than almost anywhere else on earth, the ancient 163,521-square-mile Kimberley region on the north side of Western Australia offers a wilderness cruising experience like no other. 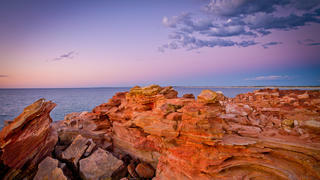 Broome, on the west coast of the Dampier Peninsula, is a gateway to the region; from here, either fly north into the heart of the Kimberley and cruise back, or cruise north and fly back. For a weeklong Southern Kimberley experience, begin by flying nearly 300 miles northeast from Broome to the fan palm-forested Mitchell Plateau. From here, a helicopter will whisk you over the tiered Mitchell Falls (a place of cultural and spiritual significance for the Wunambal people) and down to the Hunter River wilderness and your yacht. Cruising up the Hunter River to Careening Bay, you’ll enter the mouth of the Prince Regent River. Beneath the stark gaze of Mount Trafalgar and Mount Waterloo, venture past sandstone cliffs and gorges toward the beautiful terraced rock formations of Kings Cascades, where you can (cautiously) observe large saltwater crocs. The following day sample some of the world's best oysters, straight from the rocks in Camden Harbor, where the Kimberley’s first European settlement was attempted (and soon abandoned) in the 1860s. Then cruise through Kuri Bay, the region’s first pearling settlement, to Langii, where the sandstone “Petrified Warriors” represent warriors killed in an Aboriginal Dreamtime battle. Linger here awhile fishing for barramundi and threadfin salmon in Doubtful Bay; exploring 154-square-mile marine life-rich Montgomery Reef, an inshore reef that appears to rise from the ocean on a falling tide; trekking to Raft Point’s Aboriginal rock art cave galleries; and photographing the Horizontal Waterfalls, a pair of breaks in the McLarty Range. Travel between April and September, the Kimberley’s dry season. While wandering Broome’s Chinatown, delve into the town’s maritime and pearling heritage at Pearl Luggers, where guided tours explore the hazards of early pearl diving and offer a taste of pearl shell meat. Broome’s fiery Cable Beach sunsets demand a spicy beer. At award- winning Matso’s Broome Brewery, housed in a circa-1910 former bank, you can sample chili beer and other intriguing brews, such as lychee and ginger/mango. A paradise for scuba divers, Raja Ampat — a 15,000-square-mile, 1,600-island archipelago off Indonesia’s West Papua province — is a biodiversity hot spot, boasting 1,500-plus fish species, 700 species of mollusk, more than 75 percent of the world’s hard coral species and half of the world’s known soft corals. Although a week is sufficient to explore either the northern or central part of the archipelago, opt for at least a 14-day itinerary for a full experience, suggests Robba. Embark in Sorong, on West Papua’s northwest coast, and cruise northwest toward the uninhabited Wayag Islands, on the opposite side of the Equator. Spend a few days anchored in their calm, blue lagoons, paddleboarding or kayaking around orchid-covered, karst limestone outcrops, snorkeling over anemonefish, diving submerged karst walls and climbing to high point Mount Pindito, which offers sublime views over the serene scene below. Next, venture south to Penemu Island in the Fam Islands, home to the shallow teal-tipped hard coral gardens of the Melissa’s Garden dive site. Farther south are the Misool islands and the archipelago’s most renowned dives — Whale Rock, Dunia Kecil and more — as well as a marine lake, tucked in a tropical forest and teeming with harmless jellyfish, their sting so mild it’s undetectable. Arborek Village, in central Raja Ampat, is known for its pandan leaf handicrafts — hats and noken (string bags) — which nearly all the village women create and sell. Raja Ampat’s diving is excellent year-round; however, October to April is the best time for yachts as seas are generally calmer. 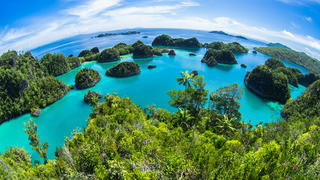 In 2010, Raja Ampat was declared a shark sanctuary — the first such sanctuary in Indonesia. One of the best places to see these protected creatures is the ranger station at Wayag, where blacktip reef sharks swim just off the beach and alongside the jetty. In eastern Misool, cruise via tender to the mighty Tomolol Cave, a water-filled cathedral with limestone ceilings. The best way to explore its inky interior is by snorkeling (with a dive light) between its two entrances; upon reaching the far one, tread carefully over a sharp, rocky path to the cool, clear lake at its end. “Located in the very heart of Melanesia, Vanuatu’s 80-plus islands combine to provide the most diverse and scenic island chain in the Pacific,” says Rob McCallum, an EYOS Expeditions founding partner who grew up in Melanesia and has led dozens of expeditions there. “Every island is different — culturally, anthropologically, scenically and biologically. 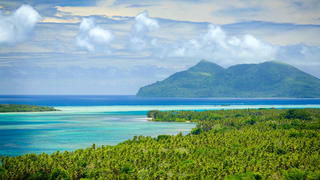 The people of Vanuatu, with their gentle smiles and warm welcomes, will be a highlight of your journey. It’s the perfect destination for expedition-style island hopping, with world-class diving, volcano hikes and a seemingly endless variety of unspoiled beaches.” Plan to spend at least two weeks here, recommends McCallum. Join your yacht in capital Port Vila, situated around a natural harbor on Efate island. Sample a local Tusker beer at the Vanuatu Cruising Yacht Club in Pontoon Bay; savor fresh seafood, world-class organic beef and fresh fruits and vegetables at a few of the 40 restaurants; and submerge to investigate the 295-foot sailing ship Star of Russia shipwreck. When you’ve had your fill of metropolitan life, cruise southeast to Tanna, home to 1,184-foot Mount Yasur, an active volcano with continuous eruptions. “Dusk on its rim is unforgettable,” says McCallum. “You require clear skies, a steady breeze and a good level of volcanic activity.” For further fiery action, head north to Ambrym, known as the “black island” due to its volcanic ash and black magic. Here, tackle the strenuous trek to the island’s twin active volcanoes, Mount Benbow and Mount Marum, and peer into a boiling lava lake. Other must-see islands include Espiritu Santo, with its wreck diving, blue holes and famed Champagne Beach; Ureparapara, where you cruise into the vast caldera of an extinct volcano; and the Reef (Rowa) Islands, coral cays enclosed by a horseshoe-shaped reef, which, says McCallum, “is paradise found.” When to go “The best cruising months are generally considered to be May to October (outside of cyclone season),” says Rob McCallum. Take a flying leap You may be courageous enough to bungee jump, but would you plunge from a 20- to 30-meter rickety manmade tower with just a couple vines attached to your legs? On Vanuatu’s Pentecost Island, local men and boys do just that every Saturday between April and June as part of a land diving ritual (Nagol or N’gol), which is both a fertility rite and yam harvest celebration. Must dive On the morning of October 26, 1942, the SS President Coolidge, a 653-foot luxury cruise liner-turned-U.S. military vessel, was blasted by mines and sank just outside Luganville (Espiritu Santo) in the Segond Channel. Only two of the more than 5,000 troops on board died. Today, the ill-fated vessel is considered one of the world’s most accessible wreck dives, ranging in depth from 66 to 231 feet. Marvel at the ghostly gathering of jeeps, tanks and guns as you salute turtles, fish and other marine life. Plan to spend at least two weeks here, recommends McCallum. Join your yacht in capital Port Vila, situated around a natural harbor on Efate island. Sample a local Tusker beer at the Vanuatu Cruising Yacht Club in Pontoon Bay; savor fresh seafood, world-class organic beef and fresh fruits and vegetables at a few of the 40 restaurants; and submerge to investigate the 295-foot sailing ship Star of Russia shipwreck. For further fiery action, head north to Ambrym, known as the “black island” due to its volcanic ash and black magic. Here, tackle the strenuous trek to the island’s twin active volcanoes, Mount Benbow and Mount Marum, and peer into a boiling lava lake. “The best cruising months are generally considered to be May to October (outside of cyclone season),” says Rob McCallum. You may be courageous enough to bungee jump, but would you plunge from a 20- to 30-meter rickety manmade tower with just a couple vines attached to your legs? On Vanuatu’s Pentecost Island, local men and boys do just that every Saturday between April and June as part of a land diving ritual (Nagol or N’gol), which is both a fertility rite and yam harvest celebration. Must dive On the morning of October 26, 1942, the SS President Coolidge, a 653-foot luxury cruise liner-turned-U.S. military vessel, was blasted by mines and sank just outside Luganville (Espiritu Santo) in the Segond Channel. Only two of the more than 5,000 troops on board died. Today, the ill-fated vessel is considered one of the world’s most accessible wreck dives, ranging in depth from 66 to 231 feet. Marvel at the ghostly gathering of jeeps, tanks and guns as you salute turtles, fish and other marine life.